So far this year's been a good one for me for crime fiction, three books by Fred Vargas, John Bude and William Shaw were excellent and now here's a fourth, Snowblind by Icelandic author, Ragnar Jónasson (translated by Quentin Bates). This is my third book for the European Reading Challenge, 2018 and covers the country of Iceland. Ari Thór Arason Lives in Reykjavik, Iceland, with his girlfriend, Kristin. He's just finishing police college and looking for a position, she's in the 5th. year of a medical degree. Ari Thór has found it difficult to decide on a career, first of all studying philosophy, then theology, both of which he abandoned mid-course before trying the police. Kristin and he have not been living together very long when he gets a job offer. 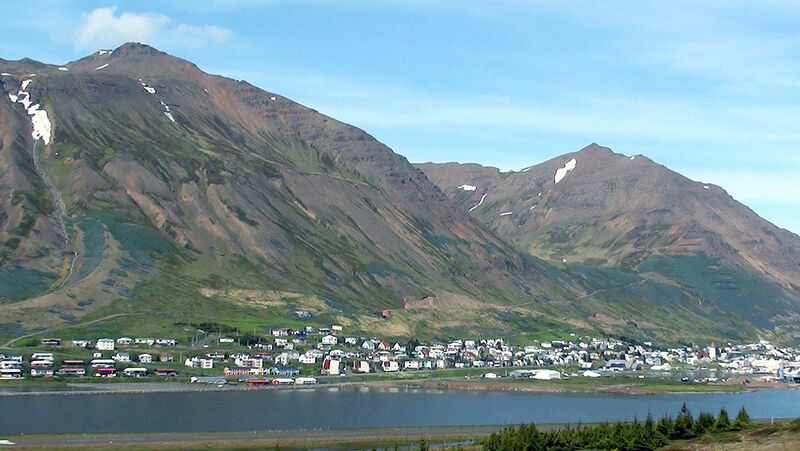 But it's not in Reykjavik, it's in a small town in the very north of Iceland, Siglufjordur. He accepts immediately before even discussing it with, Kristin. She is naturally not best pleased. 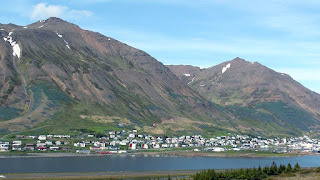 The new recruit finds Siglufjordur surprisingly isolated. The approach road is precipitous and prone to avalanches, it's not unusual for the town to be cut off for days in Winter. Thus the place is insular, claustrophobic even, everyone knows everyone and their business into the bargain. Doors are not locked at night because there is no crime. Ari Thór wonders what on earth he's got himself into. An elderly writer who is very involved in the local amdram group falls to his death down the stairs of the theatre. An accident everyone assumes. But when a local woman is found bleeding from a stab wound in the snow in her garden, close to death, Ari Thór starts to wonder. A place with no crime and two incdents like this, one straight after the other? I can't say that I'm really a Scandi crime fan, not sure why, I've tried a couple but they haven't appealed for some reason. But, while reading Fred Vargas's A Climate of Fear, I suddenly fancied reading something set in Iceland. Coincidently, Snowblind appeared in front of me on Goodreads one night so I grabbed it from the library to give it a try. Looks like an amazing spot but you can see what it would be like in winter. The story itself was very much a slow burner. It took a while to really get going, but then I suppose authors do need to set the scene with a new series, tell us about the main characters and so on. Once it got going however it was excellent. I liked Ari Thór, his background is quite complicated, he lost his parents as a child and this has had an effect... on just about everything in his life. To be honest all of the book's characters are conflicted with one thing or another, but that's just real life. This wasn't really a cut and dried murder mystery story and the ending reflects that. I liked it a lot and have reserved book 2, Blackout, from the library. Nice review, Cath, and thanks for the picture of the area. This author will be at the Malice Domestic mystery conference I'm going to at the end of April. I'm looking forward to seeing and hearing him. Hope he will be on a panel I can attend. You read so fast! lol.. once again I am stopped in the middle of a book because of the Olympics! Whenever they are on I can't stop watching.! A young 17 yr old American won gold on snowboarding "downhill".. 17 !! geez lol..
You're doing really well with the European Challenge! And this book sounds good, especially the setting. I've been watching the Olympics too - the short-track speed racing is amazing and dangerous! Kay: Thank you. Oh my goodness, first Brenda Blethyn (latest series of Vera was excellent if you haven't seen it yet) and now Ragnar Jónasson at the MD conference! If you're able to see him I hope you'll write about it. Pat: I wish I was a fast reader, I'm just average. Peter reads two or three times faster than me. Well an Olympics only turns up every four years so you have to make the most of it. LOL Yes, I saw the 17 year old on the news. Margaret: Thank you... I thought I would really concentrate on the European challenge this year and read from as many countries as possible. And a little bit different, thus - Iceland. But I'm back to Fred Vargas now, Adamsberg in the Alps. The latest series of Vera is indeed excellent! We now have Britbox (did I tell you?) and it offers the 8th season. The book sounds very, very good, and reminds me a bit of a show set in Iceland, in a place cut off by a winter storm called Trapped. I must have seen in on British tv when we still had Tunnelbear. I will look for the book. Are you watching Girlfriends? What do you think?? Over here, via Acorn, we are on episode 3. Wonderful to see older women, and three such great actresses. 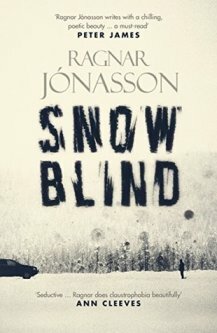 I bought Snow Blind for the Kindle, and spent a long time reading it while I should have been sleeping! I wrote comment about Girlfriends before I saw Ep. 3. There was quite a disturbing scene, which was utterly unnecessary, and I've read that British women are boycotting the show because of it. Nan: Vera was indeed excellent... my only complaint is that the series went too quickly. Shetland has just started a new two part episode... do you watch that? The new one was superb. No, I've not heard of Britbox and Trapped doesn't ring any bells either. No, I didn't see Girlfriends, saw it advertised and it didn't appeal for some reason, you know how it is. So of course I don't know what the scene was. It sounds like you were really gripped by Snowblind! LOL I hope you enjoyed it as much as I did. I was captivated by the setting I must admit. I'm ashamed to admit that I have still yet to delve into the world of Nordic Noir crime fiction, although I have many books from both genres sat on my book shelves, as for some reason I tend to prefer the look and sound of the genres in physical rather than ebook formatting. I had a set of the Martin Beck books by Maj Sjowall, donated in to the charity shop and I have set them aside on the shelf while I decide whether I would actually read them or not. Have you read any of this author's books? The scenery of the region, no matter which of the countries you are in, looks suitably stunning and spectacular and a round robin trip to visit them all, would be high on my bucket list. I'm very interested in this one, because it sounds perfect for a new book group I'm trying to launch in my town. I borrowed the European Reading Challenge idea for this new book group, which will meet once a month on a late Friday afternoon at our library, and then continue on to a local pub, if people are interested and want to discuss the book and socialize some more. I, like you, am very keen on books that have very descriptive settings set in foreign locales. Iceland is perfect for our Armchair Travelers Book Club, so I hope I get this group off the ground in early April. I thoroughly enjoyed your comprehensive review of this book! No, I'm afraid I've not heard of Maj Sjowall as an author at all so can't advise you about those. Have you looked on Goodreads to see what people think? The scenery does look amazing... a trip to visit several of the Scaninavian countries would indeed be wonderful. Norway appeals especially. Judith: Oh yes, this would be a perfect armchair travelling sort of book. I love books that actually tell me something about the country they're set in and this does that in spades. It's exactly what I was looking for and I struck very lucky. I do hope you get your book group off the ground and would love to hear about it on your blog. I want to read this. I've had it on my list and now your review of "Snowblind" leaves me intrigued. My daughter and son-in-law visited Iceland this past October and they cannot say enough nice things about the people, scenery, food, accommodations. Cath, Nightblind is the next one, and I think it is important to read in order. My Kindle edition of Snowblind told about the next few books, and it seemed that you might want to read in order. Blackout is third.